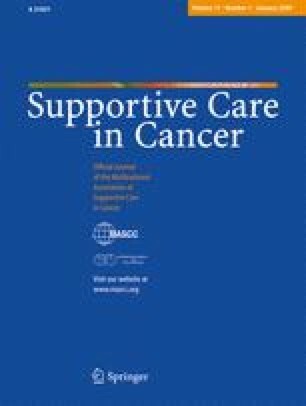 The aims of this secondary analysis were to determine the prevalence of nutrition impact symptoms in medical oncology patients at 1, 6, and 12 months after commencement of chemotherapy and to investigate the relationship of these symptoms to quality of life (QoL) and performance status. A prospective longitudinal survey was conducted in 219 medical oncology patients who had commenced chemotherapy in the past month. The Rotterdam Symptom Assessment scale assessed the number and distress level of symptoms. The association between symptoms and global QoL and performance status as measured by the Life Satisfaction Scale was investigated. Symptom prevalence as determined by the proportion of patients experiencing at least one nutrition impact symptom was 79% and 72% at 1 and 6 months after starting chemotherapy. Even at 12 months, symptom prevalence was 46%. The most common symptoms included dry mouth, nausea, and constipation with the most distressing symptoms reported as dry mouth, diarrhea, and stomach pain. A higher number of symptoms was associated with lower QoL (T1: r = −0.35, n = 217, P < 0.05; T2: r = −0.406, n = 194, P < 0.001; T3: r = −0.353, n = 157, P < 0.001). Patients experiencing more symptoms were more likely to have lower performance status at T2 and T3 (T2: n = 189, P = 0.019; T3: n = 143, P = 0.003). Nutrition impact symptoms were commonly experienced, even 12 months following commencement of chemotherapy, and were associated with poorer QoL and performance status. This highlights the importance of early identification and management of nutrition impact symptoms with adequate follow-up in order to provide optimal care for people with cancer. HT was the main author of the manuscript and assisted in statistical analysis and interpretation. EI supervised the project and assisted in statistical analysis, interpretation, and writing the manuscript. PY initiated the study, supervised the project, and assisted in writing the manuscript. This manuscript was written during an independent study unit as part of the Bachelor of Nutrition and Dietetics degree, Queensland University of Technology and the project supervised as part of an NHMRC Australian Clinical Training Fellowship (ID:324777).